Independence Day in Kyrgyzstan is celebrated on August 31. 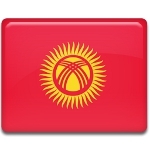 It is a national holiday that commemorates the independence of Kyrgyzstan from the Soviet Union in 1991. The territory of present-day Kyrgyzstan officially became part of the Russian Empire in 1876. Following the 1917 Russian Revolution, it was incorporated into the Soviet Russia. In 1919, the region was designated as the Kara-Kirghiz Autonomous Oblast within the Russian SFSR. In 1915, it was renamed the Kirghiz Autonomous Oblast. A year later, the Soviet government re-organized it into the Kirghiz Autonomous Soviet Socialist Republic. In 1936, the Kirghiz Soviet Socialist Republic was established. Kyrgyzstan (then Kirghizia) remained part of the Soviet Union until 1991. The country's democratic movement gained momentum in 1990, when the country was renamed to the Republic of Kyrgyzstan. Complete independence of Kyrgyzstan was declared on August 31, 1991, following a failed coup in Moscow. Independence Day is the national day of the Kyrgyz Republic. It is celebrated across the country with official speeches, solemn ceremonies, military displays, outdoor performances, open-air concerts, sporting competitions, firework displays. The biggest celebration is held in the capital city of Bishkek.